Fall is definitely in the air as the leaves start to turn colors and up here in Wisconsin we know that there is snow on the way. 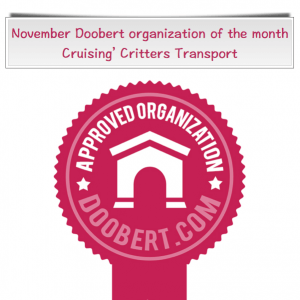 And we are very excited to share with you the November Doobert Organization of the month, Cruisin Critters Transports. Tania Reiber is the creator of this awesome transport organization and she shares her story about how she came into rescue, what advice she has for others, and of course why she likes Doobert so much. Be sure to check out her touching story about Cosmo. That’s why we rescue. Enjoy.